The name Malizia, chosen by Pierre, symbolises the Grimaldi family history and their deep connection to the ocean. It translates to ‘the Cunning One’’ a name that was given to Francesco Grimaldi in 1297 after he established the family dynasty. Pierre shows that there is a sentimental link to the name and says “I always wanted to give this name to a race boat for what Malizia represents for us in the Principality”. Malizia was built in 2015 and is a first IMOCA 60 generation with hydro foils and one of the fastest racing monohulls. She has a mast height of 29m, is 18.28m in length, 5.50m beam and has a 4.50m draught. These boats are built using composite material which is intended to reduce weight whilst also being able to endure extreme weather conditions out in the ocean. With the ability of doing 25 knots in only 22 knots of wind, the foiling system allows her to make full use of all available wind. Upwind she has a sail area between 240 and 330 m2 and downwind between 460 and 620m2. Malizia has a Canting keel which can swing to windward under sail to make the boat more stable and counteract the heeling motion, allowing the boat to travel faster. Acting as further ballast are the tanks with 2.5 tons of water on each side. 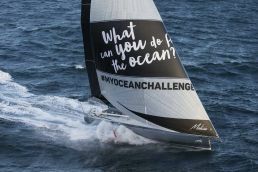 The yacht currently has a 377kg combustion engine system but there are plans in place to upgrade this to an environmentally friendly electric motor with batteries charged from solar to enable Boris to complete the race without burning fossil fuels.